Lurgan Town’s Bob Radcliffe Cup campaign was cut short on Saturday with a derby defeat by St Mary’s. Intermediate-based St Mary’s grabbed the opening goal in the 5-1 reverse but it sparked Lurgan Town into life and Geoff Greenaway made a rare but welcome appearance on the scoresheet with a volley off Johnny Hoey’s free-kick. Sights of goal also arrived for David Hamilton, Sammy Wright and Andrew Houston without success. However, three quickfire goals left Lurgan Town reeling before the break. 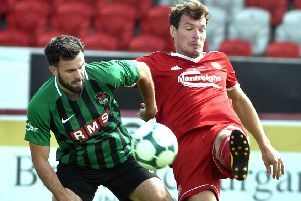 Lurgan Town used the interval to regroup and produce a spirited second-half display - with Adam Wing, Davy Trainor and Aaron Parks joining play off the sidelines. A red card for goalkeeper Robbie Redpath, however, served to increase the Lurgan Town problems before a last-gasp St Mary’s goal added to the deficit. Thanks go to Gilford Tae Kwon Do for providing matchday sponsorship. LURGAN TOWN: Robbie Redpath, James Lindsay, Geoff Greenaway, Stephen Heasley, Matthew Johnston, James McNally, Jonny Hoey, Sammy Wright, Nathan Crozier, Andrew Houston, David Hamilton. Subs: Davy Trainor, Aaron Parks, Adam Wing. Lurgan Town under 19s’ midweek Savage Cup programme featured a 7-0 success against Tandragee Rovers. Philip Bingham claimed a treble, Tom Brown grabbed two and additional goals arrived for Jake Kerr and Matthew Hagan. Friday’s meeting with Bourneview Mill produced victory by 11-0 - with five for Bingham and other scorers Adam Wing, Scott Wilshire, Josh Law, Sidenei Tavares, Eamon Coleman and Harry Wilson.